When we last moved house, the price that we paid for removals included all packaging materials. Imagine my delight when we were presented with not one but two giant rolls of bubblewrap. Of course some of it was used to package our precious possesions, but we had a good amount left over. Not to mention the fact that along with jiffy bags and nice cardboard boxes it is something which I hoard anyway, so I always have a generous amount hanging around. 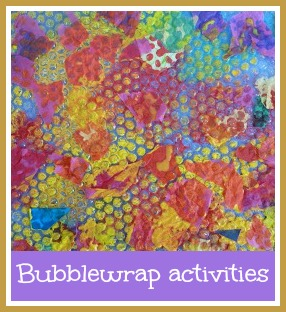 So I've put together ten crafts and activities for toddlers using bubblewrap. The most obvious thing to do - pop the bubbles. My toddler couldn't manage it with his fingers, but if you put it on the floor and jump on it you can make some satisfying pops! Or you could try hitting it with a toy hammer or pricking with a cocktail stick. Make an aquarium picture. Use the bubble side of bubblewrap to print with blue paint onto blue paper or card. For ours we glued on fish cut out from silver paper, and used shredded green paper for plants. Make a bubblewrap crocodile using a cardboard tube. Make a hanging jellyfish with bubblewrap tentacles. Make a bubblewrap bubblewrap pillow and fill it with interesting things. Make printing blocks with shapes cut from thick cardboad and covered in bubblewrap. This is a great idea for themed wrapping paper. You can also take a cardboard tube (a thicker one is best, like from cling film or tin foil) or an old rolling pin and cover with bubblewrap, paint, and roll over the paper. Paint and collage onto it. If you press tissue paper over the painted bubblewrap, the coloured circles will show through and make a really colourful piece of art work. Make a popping game to teach numbers, letters, shapes...anything really! 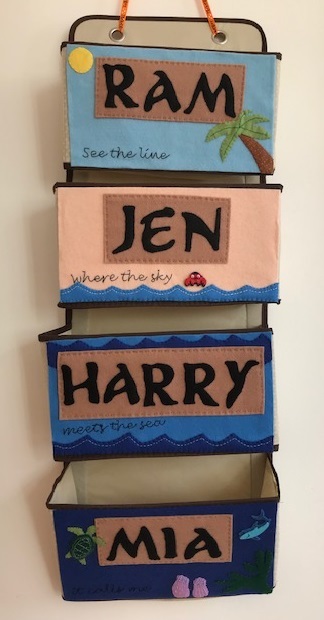 You just write onto or behind the bubbles and then get your toddler to pop them as you name them. This is a good activity for the bubblewrap that has larger bubbles. Cut the bubblewrap into strips and use it to decorate a carwash. You can go small, and make walls out of Duplo, or go large and use a big cardboard box. Just fasten long strips over one side so that they hang down for the cars/trains/people to go through. You can use bubblewrap on the floor of the carwash too to represent the bubbles. For an unusual edible craft - use bubblewrap to make toppers for fairy cakes. Such a simple idea, and they look so good! Children should always be supervised when playing with bubblewrap.